What Are Common Causes of Wrist Pain in Basketball Players? Basketball is a demanding sport that can take a toll on a player's body. Although basketball players are often concerned with maximizing energy and preventing injuries to their legs, the repetitive motions of dribbling and shooting can cause pain in a player's wrists. Falls can also cause wrist injuries and pain. If you experience chronic wrist pain or have recently suffered a fall while playing the game, consult your physician. Tendons are bands of connective tissue that connect muscle to bone, according to "Biology: Life on Earth with Physiology." When the sheath around the tendon becomes inflamed, tendinitis occurs. The condition causes pain and swelling in the affected area, and can be caused by repetitive movements and recurring injuries. Immobilize the affected area and apply ice packs every 20 minutes. 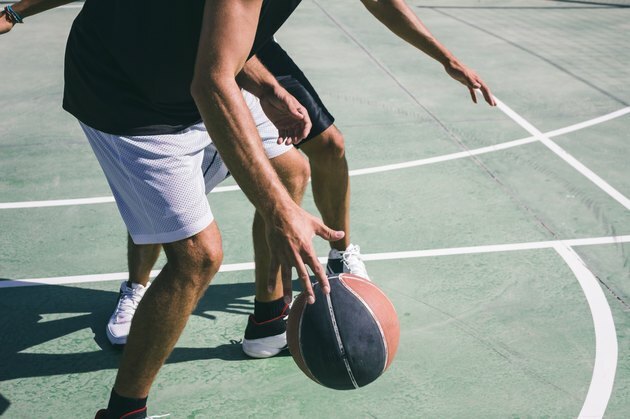 If the condition worsens or interferes with your ability to play basketball, your doctor may recommend cortisone injections or surgery. A sprain occurs when a ligament -- the tissue that connects bone to bone -- is stretched or torn. A fracture is a broken bone. The symptoms of the two can be similar and may include swelling, numbness and localized pain. Fractures typically require medical treatment and immobilization for several weeks while sprains can often be treated at home. If you've recently fell while playing basketball and are experiencing wrist pain, consult your doctor for a diagnosis of your injury. Fractures often do not heal correctly without medical treatment. Whether you have a fracture or a sprain, you should not return to basketball until you have healed from your injury. If you notice a knot in your arm, hand or wrist, your wrist pain may be due to muscle spasms. Awkward posture, putting more strain on one side of the body than the other and returning to basketball after a long period of not exercising can all contribute to muscle spasms. Massage the knot, focusing on relaxing your muscles to eliminate tension. Muscle knots typically go away on their own after several days of massage. Among older basketball players, carpal tunnel syndrome can cause wrist pain. This condition occurs as a result of repetitive motions and may cause your hands to shake. Ganglion cysts are non-cancerous lumps that can develop in the wrist. If you notice a hard, painful lump, consult your doctor. Injuries in other areas of the body, such as the shoulders, neck and hips, can cause pain that radiates to the wrist. Biology: Life on Earth with Physiology; Gerald Audesirk, et al.